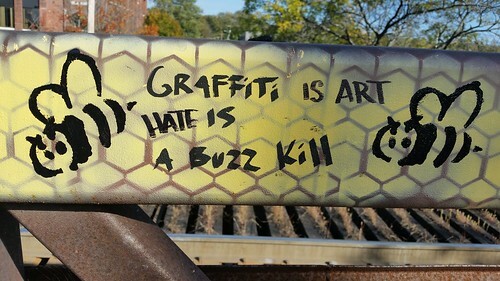 A railing on a bridge with bees and a sign, "Graffiti is Art. Hate is a buzz kill." Now, we all know that I'm a sucker for puns. This bridge was a highlight of the bike path in Burlington Vermont on Lake Champlain. I appreciated the efforts of the caretakers of this path to lighten up and infuse some amusement into the path. This particular bridge was covered in the yellow and black pattern of honeycombs along with bees and all sorts of bee-puns (e.g. misbeehaving, bee careful). This one I found intriguing because of its message as it implies that to decorate this path with graffiti is an artistic endeavor that is welcomed as opposed to hated. I have some respect for a city that wishes to embrace this transgressive art so openly.